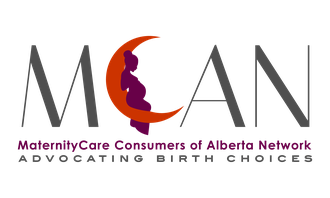 The MaternityCare Consumers of Alberta Network (MCAN) is aware of media reports that there will be no additional courses of care for midwifery maternity care services. This is in direct conflict with the wishes of consumers whose views were shared in MCAN's Listening Campaign Report (available here). Consumers have stated again and again, from rural to urban locations, that they want more access to midwives as their low-risk maternity care providers. As maternity care consumers and citizens, MCAN is concerned at the possibility of squandering the resources invested into the Mount Royal University Midwifery program students if they are not able to practice in the province of their graduation. There are many women on waitlists for midwives and midwives prepared to provide care, yet the province is risking the loss of that workforce resource. We do not believe this is responsible spending. MCAN continues to emphasize concern about the perverse financial incentives that exist within the current funding model, which sees funding for midwifery capped and allocated by course-of-care through Alberta Health Services, and physicians funded by a fee-for-service model funded by Alberta Health. To ensure responsible health care spending that is meeting the needs of citizens, MCAN President Nicole Hill states that, "maternity care funding needs to follow the user, not the provider". MCAN urges the Minister of Health, Stephen Mandel, to continue to uphold his statement from September, to do more listening when it comes to health care. Maternity care consumers are clearly stating a desire for better access to midwives as their low-risk maternity care providers. To do this, we believe the province needs not necessarily to fund more, but to fund smarter. There is an unfortunate misconception that hiring midwives requires additional funding. Babies will not wait to be born, funds will continue to be spent on maternity care in one form or another. The province needs to use the funding available more effectively and efficiently to meet consumer needs. Despite the economic climate in Alberta, failing to employ Alberta's midwives is not saving money, instead it is costing citizens more. The MaternityCare Consumers of Alberta Network (MCAN) is the provincial body that represents consumers on important maternity care health policy and other initiatives. We advocate for Alberta women's rights to make informed choices and have equal access to publicly funded, quality maternity care of their choosing in their community (whether provided by midwives, physicians or obstetricians).